Feminism is a good concept in theory but in practice it is just another Marxist tool to destroy cultures around the world. Since the Mohammedans will not listen to banning females from praying alongside men or clad them in burqa or giving divorce by saying triple talaq, nor the Christians declare a female as the next Pope, the next best target for beloved feminists are Hindus. Since they are a fragmented lot and do not organize nationwide protests, they form an easy target. For all its ills that modern feminism poses, the recent outrage is one more addition to the attempts where they are using state and mob power to push reforms down the throat of commoners. Whether forceful entry into a specific temple can be disguised as a Hindu reform is another important point to ponder. These outrages are nothing but part of global agenda to destroy native customs and cultures under the guise of modernity and liberalism. The Jallikattu ban also falls under this category and well analysed by us here. Let’s go into the details, why this recent outrage by few women has been over the top and unjustified. 1) The most pertinent point is that a temple is not a public property where people can party or drink alcohol (except in Bhairav temple!). For eg. a random stranger cannot barge into your house because it is a private property. People are allowed to form organizations and restrict their membership as well as determine use of their premises. Similarly a temple like any such organization/society is formed by its local devotees, who have the sole right to decide entry criteria. 2) Hinduism is not a religion driven by canon like Islam or Christianity and does not prescribe do’s and dont’s to everyone. All regions have their local customs which need to be respected and if needed reformed by the locals and cannot be imposed by the champagne sipping elites in Delhi circles. Women not only enter temples but engage in various religious activities in Hinduism and so specific traditions, guided by local mythology like in the case of Sabrimala or Shani temple, should not be over-emphasized or blown out of proportion. 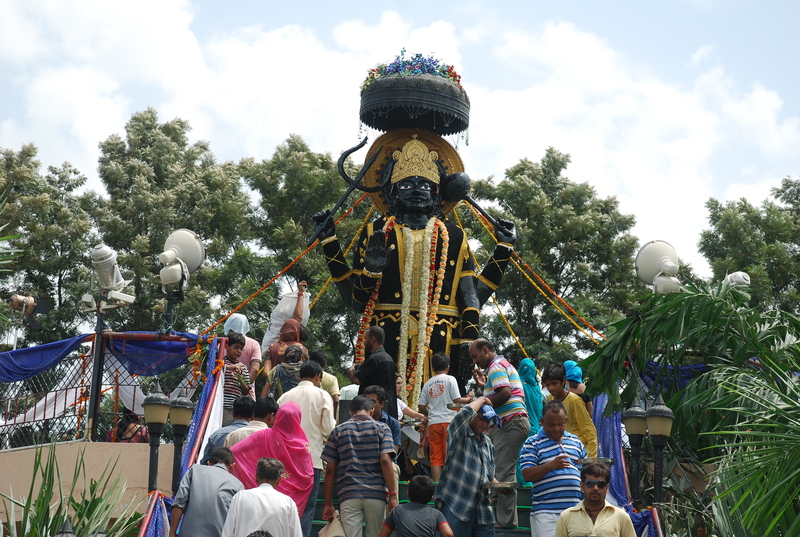 In this particular case, women are allowed to enter the temple but can not touch the main deity stone because Lord Shani is a celibate Brahmachari. Logic follows that if you are a believer you would follow and respect this tradition otherwise why would you want to enter a specific temple where you are not invited, since you can always choose another one. The vandalism by these activists only proves that this was an organized protest to gain political mileage. 3) Given point 1) and 2) above, it is no longer difficult to understand why entry restriction by these temples is not similar to discrimination against dalits in pre-independence India, a point frequently raised by self-proclaimed reformists who like to equate these issues. While dalits were systematically discriminated in many of their village temples, it is not the case with women. Just as some temples or rituals are open to men, there are many other temples and rituals which only allow women like Attukal temple or Navaratri Puja, where only girls are worshipped. So, there is no reason for Indians to blindly ape the fake equality notions from the west and kill their traditions. Given the flexibility provided by Hinduism, these women who are opposing this particular temple tradition could have proved their case much more easily by building their own temple and worshipping Lord Shani. It would have been the most natural and Dharmic way to take this debate forward, but instead they created a ruckus to generate cheap publicity. Since reform was not part of the agenda, they have achieved what they wanted i.e. another controversy. Fact of the matter is that most of these self-proclaimed liberals and feminists, who are engaged in such protests, are the most illiberal kinds and treat everyone else, who do not toe their line, as primates. They are just trying to fulfil “brown men’s agenda” like the famous “white men’s agenda” of the past. Unfortunately, most Hindus do not understand the designs of the international cabal that is working to deconstruct each and every Hindu tradition and alienate them from their roots under the garb of modernity, feminism, or other famous cultural memes. Since most western social disciplines draw heavily from Judeo-Christian theology, like their cousin monotheistic cults, they want to force everyone to follow same norms around the world. All these issues from Jallikattu to Shani temple should be seen under this light and recognized as an assault on freedom of religion. Whether Hindus will be able to thwart these attempts against cultural genocide is something that will depend on how they perform in this war of memes!